This recipe was given to me by an elderly Israeli woman who I used to visit and help. She was an amazing woman and this sauce, while slightly adapted from her original (I like mine spicier) is in memory of her. I should also warn you, this stuff is addictive and some of my friends just eat it by the spoonful. 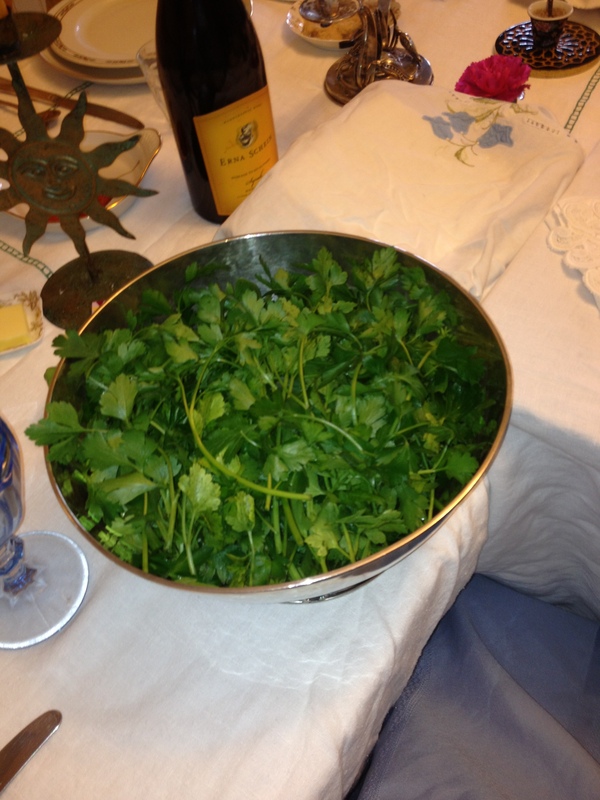 The tops only of 1–3 bunches fresh parley, Italian flat preferred, washed very thoroughly, the bucket method (putting all the parsley in a large bowl or bucket of water, soaking it, then draining and doing this two more times over ½ hour to an hour). Then dry or drain so the parsley is not too wet. You can do this the day before and keep the parsley that has been washed in a cloth bag or dish towel in your fridge. One whole bulb of peeled cloves of garlic per 2 bunches of parsley (2:1 ratio, 2 bunches of parsley to 1 whole bulb of garlic). The garlic must have the centers removed from each clove, this takes about 20 minutes to a ½ hour depending on your technique. Do not make this recipe or any recipe using raw garlic without removing the darker colored centers of each clove of garlic. The only exception to this rule is if you are using very fresh garlic that is young, it won’t have had time to spoil in the center. Also, if you are baking garlic you can avoid this step, but for any raw garlic dish, not doing this will make your recipe harsh, and bitter and will upset stomachs as well. 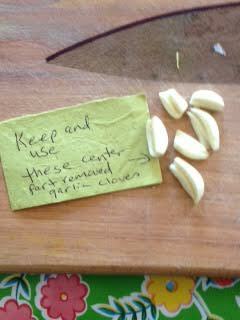 One to two whole bulbs of garlic, not cloves, but bulbs, the whole bulb times two. This garlic MUST be prepared as described and shown or else the sauce will not be good. See the Ten Commandments of Nicole’s Kitchen (in reference to following my directions, refer to commandment #1). Combine all of these ingredients in the blender and blend away. This sauce is to die for. Put it on everything and anything, bread, fish, meat, tofu, veggies. Don’t cook this sauce though or use it as a marinade. It is best cold and will keep for about 5 days in the fridge. You can use fewer peppers if you want less spice, or more if that’s your desire.